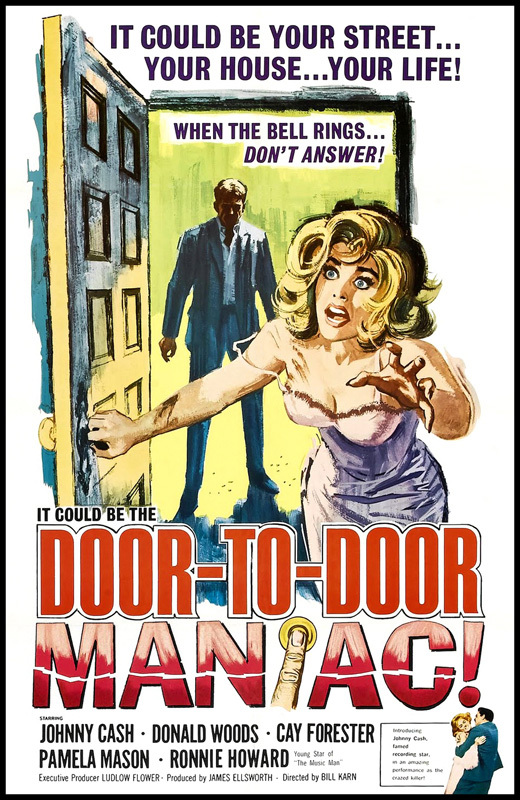 DOOR TO DOOR MANIAC [a.k.a. Five Minutes to Live] (1961). Looking for some trashy nonsense? Well, I guarantee this chunk of drive-in swill will have you howling from start to finish, primarily due to its fascinating, psycho performance by a young, obviously coked-out-of-his-skull Johnny Cash, who plays the title character. Nowadays, Cash probably wishes he could round up all the prints of this thing and burn 'em, but as far as I'm concerned, this film is one of the best things he's ever done. The first time we glimpse him, Johnny's machine-gunning a cop in cold blood, with veins bulging in his temples and heavy bags under his eyes. And his character is one of the most whacked-out celluloid crazies of all time... Basically, the film is your standard thriller, with veteran screen goon Vic Tayback narrating the tale in flashback crime noir fashion. Vic's half-baked robbery plan revolves around a bank's vice president and his wife -- by holding the woman hostage, the vice prez will have to hand over all the loot, or lose his better half. Pretty average stuff, all in all, but Cash takes his kidnapper role into a new dimension of dementia. He invades the suburban household, his gun in one hand, guitar in the other, and then proceeds to make himself at home, coming onto the wife, making her dress up in her frilliest negligee, and singing her the toe-tapping little ditty, "Five Minutes to Live" (written by Cash). In the early '60s, this must've been pretty sleazy stuff. But in the '90s, it's utterly hilarious, and no matter how good your imagination, you can't forget that this guy who's slapping around a housewife on-screen is the same person who gave us "A Boy Named Sue" and "What is Truth?"... Director Bill Karn gives the proceedings an efficient B-movie air, but with the exception of Cash's hopped-up histrionics, it's pretty forgettable. There's a somnabulistic subplot about the hubbie's marital problems and infidelity, and even Ron Howard (age 8) pops up on hiatus from THE ANDY GRIFFITH SHOW to play the snotty-nosed kid (and during one optimistic moment, almost gets shot!). But it's Johnny's show, without a doubt, and trash mavens will revel in his googly-eyed "acting" ability.